Yet it often is left in the hands of the resident “I.T. Person”. Your office’s network does not have to look like the mess of cables in the picture above. Preventative measures should be put in place when designing your network cabling infrastructure and rack layout. 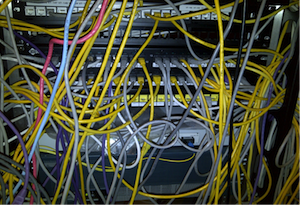 The team at CORE Cabling are the experts in network room clean-ups, but we would rather see you never get to this point. Once we complete any new structured cabling installation, CORE technicians will train your staff on proper cable management techniques. There is a common denominator in all of these scenarios: no horizontal or vertical cable management. As with most messy network rooms, the lack of cable management is caused by the unintended consequences of not allotting enough rack space to house future cabling or network growth in the design phase. Cable management is one of the most important items to a quality cable installation. Therefore, rack space is often at a premium. Take a step back and make sure that your network room is the right size for today, and many years down the road. Whenever we are approached about a network room design, we always ask for space that can accommodate installing an additional network rack or cabinet for future considerations. If your cable management, does not look like the image on the right, please contact CORE Cabling immediately. 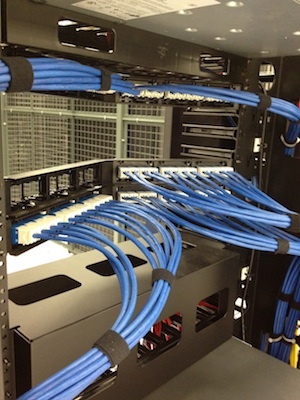 We want you to have an impressive looking structured cabling system — one that you can brag about!